Tomatoes, native to Central, South and North America, are members of the Solanum lycopersicum family. Tomatoes grow on two types of plants: determinate and indeterminate. Determinate varieties grow to a specified height and produce one round of fruiting each season. Indeterminate plants grow and produce fruit throughout the season until the first frost. Depending on variety, tomatoes can be red, white, orange, yellow, brown or purple and form several shapes, including round, oxheart and oblong. Tomato plants form different root systems depending on the method of propagation. Seed-planted tomatoes develop a taproot system, consisting of a strong central root that shoots deep into the soil and smaller lateral roots that grow out of the main root, near the top of the root. Tomatoes grown from cuttings develop a fibrous root system, comprised of a series of small, stringy roots that form a horizontal mat near the soil line. The stem forms a terminal bud at the tip and lateral branches that form from a spiral pattern of nodes along the length of the stem. The stem, branches and foliage are comprised of vascular bundles that carry moisture and nutrients to the plant and growing fruit. As the tomato plant ages, the stem becomes woody and fibrous but maintains the vascular system to continue feeding the plant. Pruning changes the structure of the plant by causing an increase in lateral branch production. 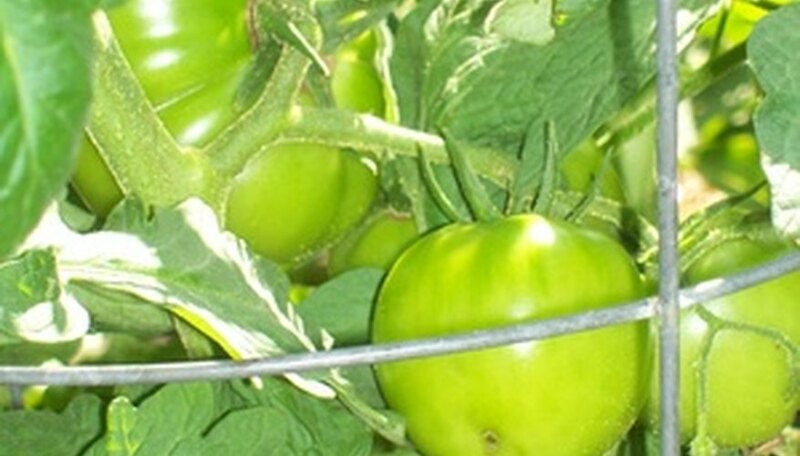 Tomato foliage, ranging from light green to dark blue-green in color, is composed of compound leaves that form on the lateral branches of the plant. While variety determines the ultimate shape and size of the leaves, glandular trichomes (tiny hairs) cover all foliage, branches and stems and secrete a greenish-yellow substance that emits the pungent "tomato" smell and leaves behind sticky residue when touched. Flowers form on the branches in simple or complex patterns depending upon pruning activity. Many factors affect the number of blooms produced, including temperature, nutrients and moisture levels. Tomato flowers, pale to bright yellow in color, are typically less than one inch in diameter. Classified as perfect flowers, tomato blossoms have both male and female organs, five long petals, and the ovary that will eventually form the fruit. In order for fruit to form on the plants, pollination must be initiated, manually or through the aid of insects and wind. After successful pollination, tomato flowers fade and fall away to expose the swelling ovary. Fruits start out small, firm and bright green in color. They maintain the green coloring until the fruit has formed its final shape and size, at which point the color of the flesh and skin start to change until it reaches its final hue, indicating ripeness.